Legendary cacao has a long history of medicinal use throughout Mesoamerica and South America. Today, science confirms chocolate has many favorable qualities that support health and psychological well-being. The benefits of this magical bean are magnified when the cacao is high-quality, raw and organic. When Europeans began exploring the New World, Columbus and his crew were the first to encounter cacao when they seized a canoe at Guanaja that was filled with strange 'almonds'. Eventually it was discovered the 'almonds' were actually cacao beans used as a source of currency in Mesoamerica. Chocolate is not only a food, but also a medicine. Preparations are well documented by the explorers who came in contact with cacao during their travels. Cacao medicinal properties were noted to alleviate fever, anemia, poor appetite, metal fatigue, poor breast milk production, as well as tuberculosis, gout, kidney stones, and low virility. This delicious bean was famous for healing the nervous system and improving digestion and elimination. Jump to the modern day and numerous studies celebrate the many virtues of chocolate. Research confirms that chocolate helps to relieve emotional stress. 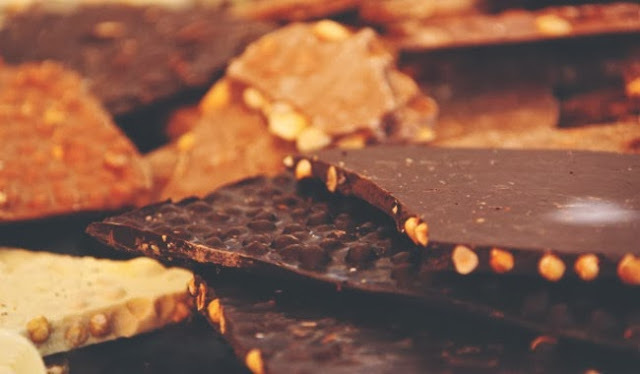 Stress hormones and stress-related biochemical agents were reduced when volunteers, who rated themselves as highly stressed, consumed 1.4 ounces of dark chocolate per day for a period of two weeks. Another study found that cacao flavanols (CF) improves cognitive function. In a randomized, double-blind trial, 30 healthy adults consumed either 520 mg or 994 mg of a CF infused beverage. Both groups showed significant improvement in mental acuity, while a reduction in 'mental fatigue' was only found with the lower consumption of 520 mg. The researchers suspect the results may be related to the effects of CF on blood flow. Cacao mass also contains potassium, phosphorus, copper, iron, zinc, and magnesium which contribute to cardiovascular health. Chocolate has the ability to trigger the release of dopamine and the endorphin phenyethylamine, both of which soothe the symptoms of premenstrual syndrome and depression. Due to its high valeric acid content, cacao has stress relieving properties despite the presence of the stimulants theobromine and caffeine. Yet not all chocolate is created equal. Organic, raw cacao reigns supreme with maximum nutrient content compared to other forms. Since raw chocolate is processed at low temperatures, it retains much more of its famed nutritional value than if it were roasted. As seen in David Wolfe's, "Naked Chocolate: The Astounding Truth About the World's Greatest Food", raw chocolate has many high-quality nutrients such as manganese, vitamin C, and omega 6 fatty acids. Raw cacao also contains powerful antioxidants along with a significant amount of chromium which balances blood sugar levels. Additional benefits are found in neurotransmitter modulating agents that act as natural antidepressants. "They allow our neurotransmitters like serotonin to remain in our bloodstream longer that usual. This makes us younger," explains Wolfe. He believes that raw cacao is an excellent way to enhance health while calming the heart, amplifying sensuality and enriching one's love life. Live your bliss and savor the wisdom of the ancients. Invigorate modern vitality with the many extraordinary traits of raw cacao.